One way to look at just how unique these lists are is to compare how frequently the most popular selections appeared with how many of the selections were only made once. 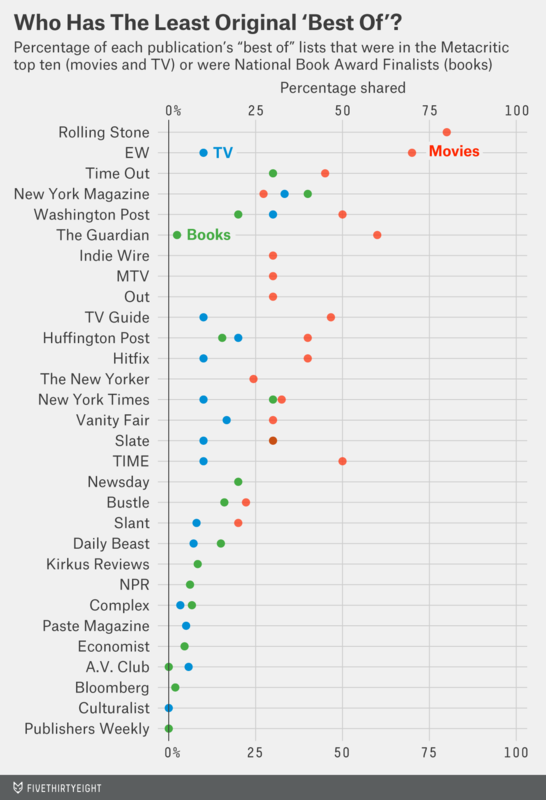 As far as the most frequent selections are concerned, the lists of best books were the least uniform, whereas every movie critic in my sample agreed that “Boyhood” deserved to be listed among the year’s best films. TV shows had the lowest percentage of titles that appeared on only one list. One reason the “best books” lists were the most diverse is because they were the longest. While most of the lists looking at movies and TV shows were limited to 10 or 20 titles, a lot of the books lists topped 100 titles. I asked Publishers Weekly’s deputy reviews editor, Gabe Habash, why he thought lists of the best books were so long. As it turns out, Habash hit the nail on the head. According to the bibliographic information publisher Bowker, there were 1.4 million books published in the U.S. last year, whereas the Motion Picture Association of America‘s data shows that only 659 films were released. Numbers on TV shows in production are harder to come by, but Showtime’s president of entertainment, David Nevins, has estimated that there are currently about 350 scripted original shows in production. By those numbers, it seems like book critics are actually a lot more unified than they should be. So critics in some areas simply have less choice when it comes to making their “best of” lists. But even where there’s still plenty of room for originality, consensus is pretty powerful. Who are the main culprits of groupthink here? Of the 30 publications included in this analysis, who’s most willing to go out on a limb? First we need to determine a baseline. For movies and TV shows, Metacritic puts together a list based on “a weighted average of reviews from top critics and publications.” And for books, the National Book Critics Circle finalists would be the best equivalent, but those awards don’t come out until next year, so National Book Award finalists will be the proxy. In the chart above, the closer the publication’s score is to 0, the more unique its lists are. The “best movies” lists are by far the least unique, with Rolling Stone leading the herd. But while New York magazine looks good by comparison in picking unique films, it has the most unoriginal picks for both books and TV shows. There’s a lot of variation across lists, but there is a slight trend in which publications that are more popular or general interest adhere more to the consensus while the more niche publications are less unified. Publishers Weekly, Slant and Culturalist — the mavericks in books, movies and TV shows, respectively — are all among the most niche publications on the list. But where consensus does exist, it’s not necessarily intentional. Ryan told me that when she’s writing her own year-end list, she tries “to go into a mental lockbox” and that she refrains from reading other people’s lists because she doesn’t want to unconsciously imitate them. She thinks that’s how most critics out there behave. Magazines, newspapers with national reach and entertainment blogs fall under this domain. The full list is: the A.V. Club, Bloomberg, Bustle, Complex, Culturalist, The Daily Beast, The Economist, Entertainment Weekly, Hitfix, The Huffington Post, Indie Wire, Kirkus Reviews, MTV, New York magazine, The New York Times, Newsday, NPR, Out, Paste Magazine, Publishers Weekly, Rolling Stone, Slant, Slate, The Guardian U.S., The New Yorker, TIME, Time Out, TV Guide, Vanity Fair and The Washington Post. Some publications had dozens of categories for books, and hundreds of books within each category. For these, I used the top or featured book in each category.